My main message in everything that I’ve ever done is to be accountable for your career and take charge of your own life. 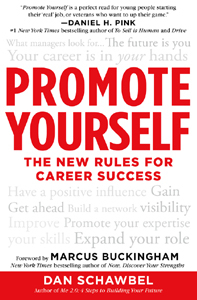 On the cover of my upcoming book, Promote Yourself, it says “Your career is in your hands” and it’s such a powerful phrase because there’s so much uncertainly in our lives and we can’t count on anything or anyone to push us forward. When the economy was good and people would fluidly move from college to a job and then retire, employees expected their company to take care of them. Today, the reality is that companies don’t take care of their employees like they once did. For example, there are no more pensions that would help employees retire. We might not even have social security in in the next twenty years. I regularly hear stories of employees losing their jobs on a moments notice due to mergers, acquisitions and layoffs. I get emails about people complaining about how they can’t find jobs or that they are stuck in their current job and don’t know their next move. You can read my books, take my online classes and listen to me speak, but at the end of the day, you have to make things happen. I won’t be sitting next to you when you’re trying to negotiate your salary or during a job interview. Your role isn’t just that of an employee anymore. You have to be the CEO of your own career and make decisions based on where you want to go, not where you already are. Starting today, you need to sit down and think about what your next step is. How are you going to take to the next level? What skills do you need to have? Who do you need to meet? What makes you different? Ask yourself these questions and be honest with yourself. Understand that there are millions of people out there that are having the same challenges as you are and that you can figure out solutions together. If you want to push forward, you are going to need to put your ideas, skills and passions to work. Instead of blaming others for your failures, own them and improve on them. The most successful professionals are the ones that are accountable for themselves. Are you one of them?